Tuscany is the birthplace of the Renaissance…and for a very good reason. As much as Michelangelo, Da Vinci and all the other great artists were drawn to the region because of its landscapes, people and architecture, it’s the special quality of the light that made their masterpieces possible, rendering all of Tuscany a single, enormous living canvas. It’s probably fair to say that what the Renaissance artists discovered about light, while painting and sculpting in Tuscany, had as much to do with making light the essential element in all photography as any science or technology. For any photographer, especially those wanting to advance to a higher level of creativity, Tuscany is one of the few perfect laboratories in the world. Here, light forces its way into every composition and decisions about camera location and angle, lens and filter. Tuscany has one of the most diverse geographies in Italy. There are flat areas along the coastline and in the major river valleys, which rise into softly rounded, hilly vistas, and then to the hard, jagged peaks of the Apennine mountain range. It’s this variation in altitude that allows the sun to cast its light in infinite intensities and paint the sky with colors found in few other places in the world. As one traveler described the early morning light seen from his hotel window in the tiny hill town of Montalcino, “…the sherbet shades of tangerine, lime green, and lavender slowly turned into the brilliant aubergines, scarlets, and finally sunlit yellows…” Even as morning progresses, a soft fog or haze lingers in the valleys, kissing the hillsides and carefully misting moisture onto the delicate skins of the wine grapes and olives. Another traveler thinks the dusk light in Tuscany is like looking through a pure, golden honey. The light seems to drip from the sky, coating everything in a fine radiance and creating shadows that are never stark or deep, but pronounced just enough for a soft contrast. This is the kind of light that is found in Florence: defining the elegance of Piazza della Signoria, illuminating street artists in Piazza della Repubblica and coloring the Arno River in purple hues. The “magic hours” of dawn and dusk are truly magical in Tuscany, which is why any photographer traveling there must be prepared to reserve these periods in his or her schedule. Although photographers are often told to avoid the high, overhead light of midday, this is not the case in Tuscany. The honeyed light is full, but never harsh, clearly defining the structure, color and details of landscapes, the dense architecture of hillside towns and the timeless beauty of family villas. 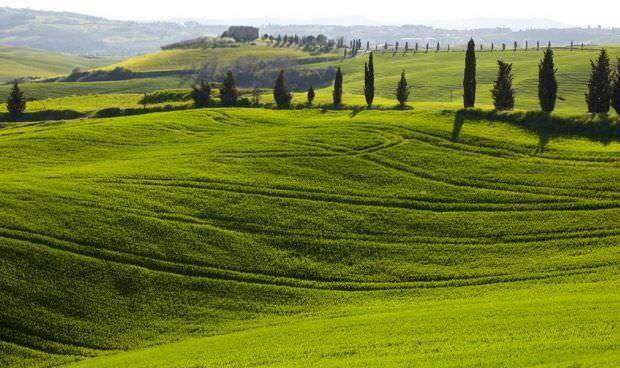 The warm light of day is when you want to be cycling through the amazing countryside of the Chianti region, strolling through the medieval streets of San Gimignano and walking the gentle hills of the Val D’Orcia with its dark cypresses, red poppies and yellow sunflowers. The light of Tuscany creates a completely different palette along the Etruscan Coast where it meets the Tyrrhenian Sea. From Livorno to Piombino is one of the least spoiled coastal environments in Italy. As in many places along the Mediterranean, the blue of the water would be impossible without the special sunlight in this part of the world. Being located in a northern section of the Mediterranean, the waters of the Tuscan coast assume an even different and deeper color of blue and emerald green than farther south. The light warms pure, white beaches as well as the distinctive architecture of seaside medieval towns and the lush pine forests that stretch into the interior. Within in these tall forests, the light takes on a magical quality that will create a fairy world for your camera. After thousands of years of the handiwork of humans, Tuscany has become a huge, open-air museum of art, architecture and life lived to the fullest. It’s the constant recognition and celebration of the light, illuminating the human and natural masterpieces, that is the essential element of Tuscany and the wondrous adventure and learning experience awaiting every photographer. To learn how you can experience Tuscany and capture its astounding beauty and light with your camera, visit TuscanMuse.com.